The Hudson River was inhabited by native hunters and gathers going back nearly 8,000. Archeologists have found sites with artifacts in numerous locations along the river showing evidence of their existence. Some 1,000 to 2,000 years ago, these native groups started cultivating crops including corn, squash, beans and tobacco and they established semi-permanent settlements along the Hudson River. In the summer of 1609, Samuel de Champlain was exploring the St. Lawrence River. He travelled up the Richelieu River with a party of Algonquins and Hurons, agreeing to help these two tribes in their campaign against their enemy, the Iroquois. For Champlain, providing this support helped secure a fur trade deal. 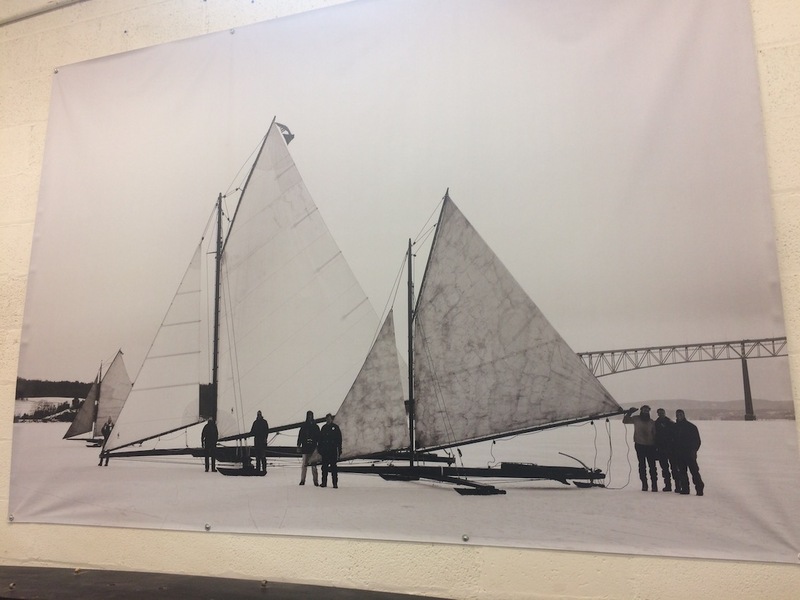 Champlain was the first recorded European to see Lake Champlain. Meanwhile, British explorer Henry Hudson, in the employ of the Dutch East India Company, was heading up the eastern seaboard from Virginia. There is an absolutely fascinating coincidence here. Less than 2 months after Champlain reached the south end of Lake Champlain, Henry Hudson reached the northern most point of his exploration on the Hudson River, reaching an area now called Albany. These two explorers were less than two days travel apart. Not only was the Hudson River a heavily travelled route for trade between native tribes and between the native tribes and the French, English and Dutch, it was also the route used for many significant battles including battles between native groups, battles between the English and French for their colonial objectives as well as battles between the colonies and the British as the colonials sought to obtain independence etc. Heading upstream on the Hudson River, there are many areas where there is no development in sight and it is quite easy to imagine native groups paddling up and down the river, or European explorers making their way up the river in their search for a short cut to Asia. Those who came long before us would be mightily shocked to see how we navigate the river today. Pleasure craft, commercial barges with powerful tugs pushing them along, or the occasional ocean going vessels make their way up and down the river daily. Sunday July 9, 2017: This morning, after a noisy night at anchor with lots of freight train traffic right next to our anchorage at Stoney Point on the Hudson River, we raised anchor and back tracked a mile to fuel up at Panco Fuel Dock. It is reportedly the best deal for diesel on the river, and indeed, at $2.59 per gallon for our 165 gallon purchase, we were very pleased. Then we continued our upstream trip, aided by a 1 to 1.5 knot tidal current pushing us along. We continued a relatively short distance to Pollepel Island to anchor for the night. 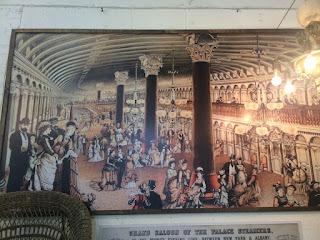 This island was made famous by the construction of Bannerman’s Castle in the early 1900’s. An eccentric Scot named Francis Bannerman became a dealer in military surplus. He bought this island on the Hudson and built a castle and other structures on the island to store his growing arsenal of munitions and military equipment. Business shrank later in the 20th century due to increased government regulations and restrictions. Francis Bannerman died in 1918 and his castle was partially destroyed in 1920 when 200 tons of shells and gun powder exploded in an ancillary building. The property lay vacant for many years, finally being purchased by the State of New York in 1967. The military equipment was all removed and briefly, tours of the island were offered. Fire, vandalism and neglect left the castle in ruins. However, this island certainly provided an interesting backdrop for our anchorage today. We had a perfectly relaxing afternoon and evening on a glorious summer day. 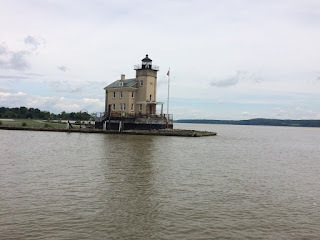 Monday July 10, 2017: Today we headed a further 29 nautical miles up the Hudson River to Kingston, New York where we took a dock at the Kingston City Marina so we could explore the town. To get there before noon, we left at 0700 hours and had a current against us for a few hours before the flood tide turned in our favour. 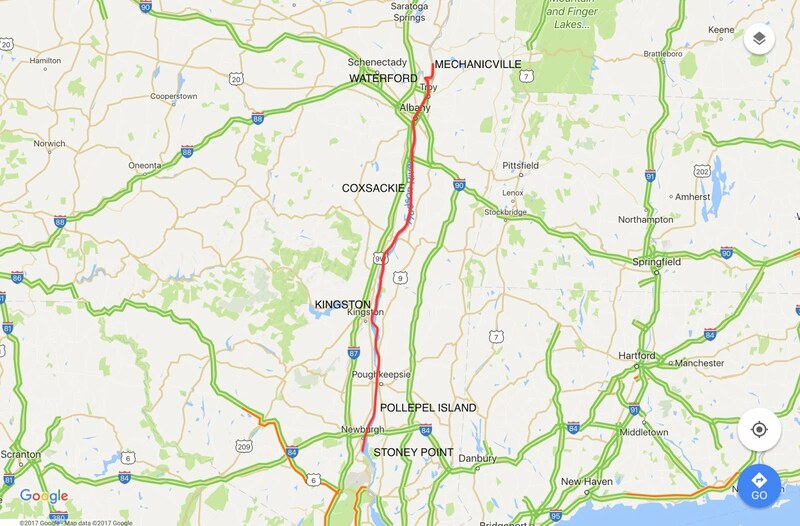 Surprisingly, there has been very little boat traffic on the Hudson River so far. However, there has been an abundance of train traffic - freight trains on the west side of the river and commuter trains on the east side. One particularly long and impressive freight train had 138 cars and three engines. Cruising up the Hudson River has been particularly relaxing with the calm water on the river and the backdrop of rolling hills, forests and small communities making for a particularly scenic trip. 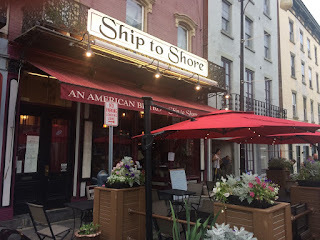 In Kingston, we headed to a particularly well rated restaurant with a name that resonated with us - “Ship to Shore”. What an absolutely delightful spot, filled with character, a great menu and friendly, helpful staff. For example, when Jan asked where a post office was so she could mail a letter, our waiter said, just hold on to it for 5 minutes and our postman will be in the restaurant shortly; he will take your letter for you. Sure enough, in a few short minutes a friendly post man was there. The food lived up to its reputation - we absolutely loved it. It was really quite a marvellous little museum to visit. 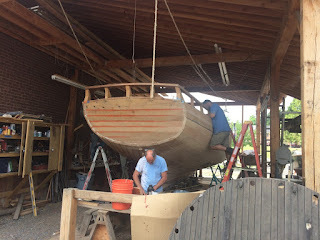 Next to the museum was a wooden boat building school with a few projects on the go including the refurbishment of the Woodie Guthrie wooden boat. Later, at the patio of a hotel next to the Kingston City Marina, there was a live band playing great Motown music that we really enjoyed. 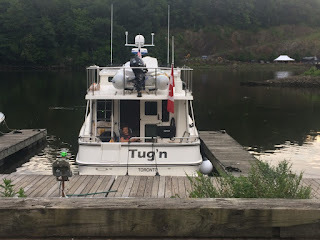 About an hour after they stopped, there was an informal jam session by various musicians including an accordion player, a fiddler, several guitars and a banjo player, in the park right next to the boats. How great is that. This was certainly an entertaining and fun stop. Tuesday July 11, 2017: Today we headed a further 31 nautical miles up the Hudson to the small village of Coxsackie (pronounced cook-sackie). It was a very hot day and we were after some breeze, so we anchored just off the Coxsackie Yacht Club, partially behind an island. The river is getting much narrower now and the places to anchor (so you don’t interfere with river traffic) are becoming few and far between. 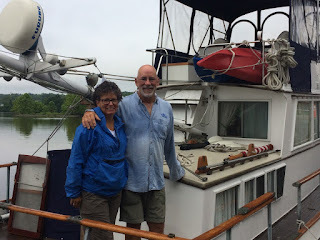 Shortly we will be entering the Champlain Canal with a height restriction of 17 feet, so after anchoring, we helped Bob and Jan on Wings, to lower their mast. While undertaking this job, we saw our first ocean going ship on the river pass us. It was a lovely and quiet evening at anchor on the river and thankfully we could only faintly hear the train traffic far off in the distance on tracks that were much further away from the river. Interestingly, all along the Hudson River, there were free pump our facilities (or just a nominal ~$2 fee), much like in Maine. As many of the boats in this area also boat along the Atlantic Coast and may well have been used to discharging waste overboard in the ocean, this is a very welcome service to ensure boaters do the right thing. 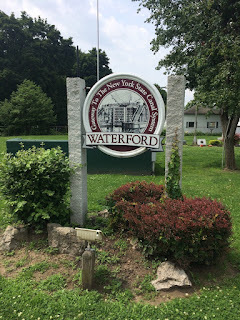 Wednesday July 12, 2017: Today we headed to Waterford, a further 27 nautical miles. They is a uniquely located community. 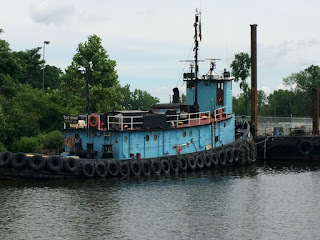 Just before Waterford, you pass through the first lock on the Hudson River, at Troy, New York. This is a “controlling lock” that effectively ends any further tides on the Hudson. 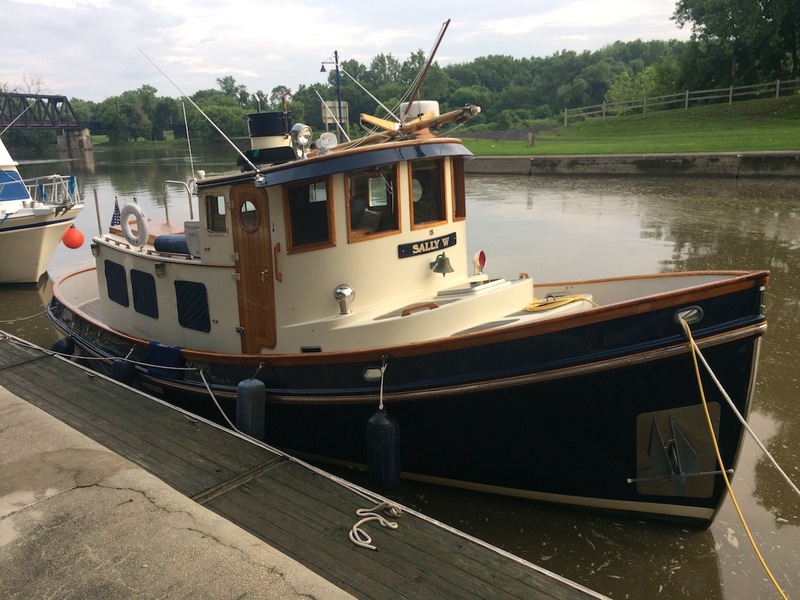 Just north of this lock, at Waterford, boaters make a decision: head east (turn left) to enter the Erie Canal to make your way to Lake Ontario, or places further east like the Finger Lakes or even as far as Lake Erie. 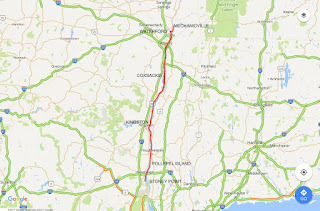 Or, head north (straight ahead), through the Champlain Canal, to Lake Champlain and further on to the Richelieu River and St. Lawrence River. Most boaters make a point of stopping in Waterford for at least a day. The stop is made even more enticing with free docking, free hydro, free water, washrooms and showers for up to two days. There are nearby grocery stores, good restaurants, places to walk and/or hike. The visitor centre is staffed by volunteers who are a wonderful source of information on all things related to the town. Clearly the program works. Cruising guides and word of mouth keep a steady stream of boaters arriving and they all spend money in the community. We were greeted by other friendly boaters who helped with our docking lines, including a couple named David and Judy, aboard a 1969 classic, wooden 36’ Grand Banks named “Katherine”. Later, David and Judy joined us aboard Wings for a Happy Hour and a game of Five Crowns, which was great fun. David proved beyond all doubt that this is a game of luck. It was their first time playing and David won the game! David & Judy aboard Grand Banks "Katherine"
I’d hazard a guess that most boaters visit a quirky restaurant in Waterford named Don & Paul’s. It looks much like it probably did in the 1950’s with an eclectic collection of memorabilia decorating all available wall space. The menu offers a good collection of basic breakfast and lunch items that are available all day long. The food quality is exceptionally good, very generous and unimaginably inexpensive. For example, my very large and delicious omelette and toast was only $3.50. Fran’s Philly Cheese sandwich was $5.00. The restaurant’s primary focus was catering to their local client base and the place was packed with locals who all knew each other. A room near the back of the restaurant had a pool table and a group of six to eight elderly local men were always playing a game. 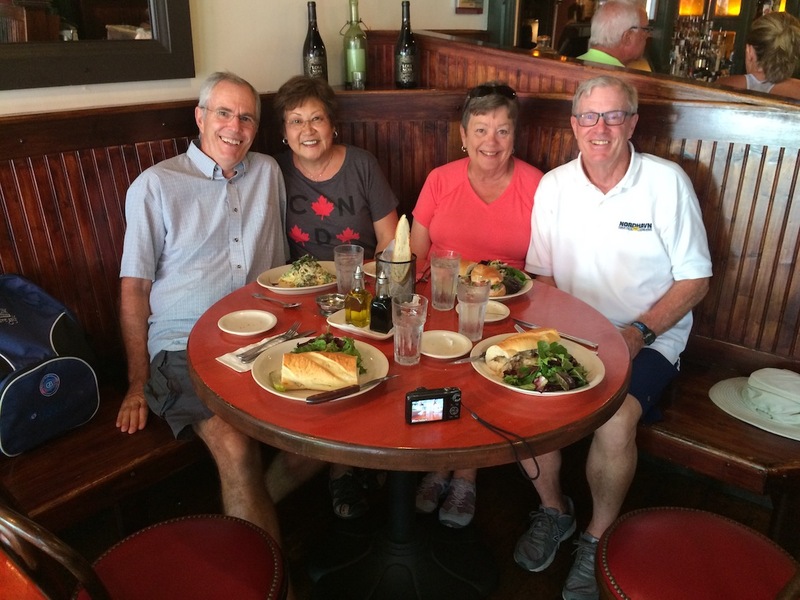 There was a special kind of interaction between the restaurant and their local clientele that added to the fun atmosphere of the place. Visiting here was great fun. Thursday July 13, 2017: Today was my 65th birthday and it was filled with lots of memorable activities. Best of all was the phone and FaceTime calls with our daughters and some of the grandchildren. I also had many calls and emails from family & friends plus numerous Facebook good wishes throughout the day. We fit in another visit to Don and Paul’s for breakfast - just as fun as yesterday’s visit. Finally, Fran made a magnificent salmon dinner which we shared with Bob and Jan. It was followed by cake and ice cream. There is nothing quite like a gourmet meal on ones own boat to make it a special birthday to remember. After dinner, we were delighted to see three deer wandering about on the shores of the island, just across the channel from us. Friday July 14, 2017: After a relaxing full day and a half in Waterford, we moved on into the Champlain Canal, passing through locks C-1 and C-2, making it a rather short day trip to Mechanicville, New York. These locks on the Champlain Canal are quite a bit bigger than locks on Ontario’s Trent Severn Waterway and Rideau Canals. We were also surprised and delighted that the Champlain and Erie Canal systems were celebrating their 200th anniversary and they were free this season. What a welcome and unexpected bonus. Mechanicville, from a boater’s perspective, seems to live under the shadow of the very successful Waterford. We did a brief walk about, had a shore lunch and did some banking at the local TD Bank, but that was about it. I think we were the first customers of TD America's Most Convenient Bank, from Canada, to arrive by boat. We had a quiet evening with a movie and an early night. This week, I was reminded of folk singer Pete Seeger and the magnificent work he and his wife Toshi did, beginning in 1966, starting Hudson River Sloop Clearwater Inc. Their non-profit organization based in Beacon, New York sought to protect the Hudson River and surrounding wetlands through advocacy and public education. The organization is also known for its sailing vessel, the sloop Clearwater and for its annual music and environmental festival, the Great Hudson River Revival. 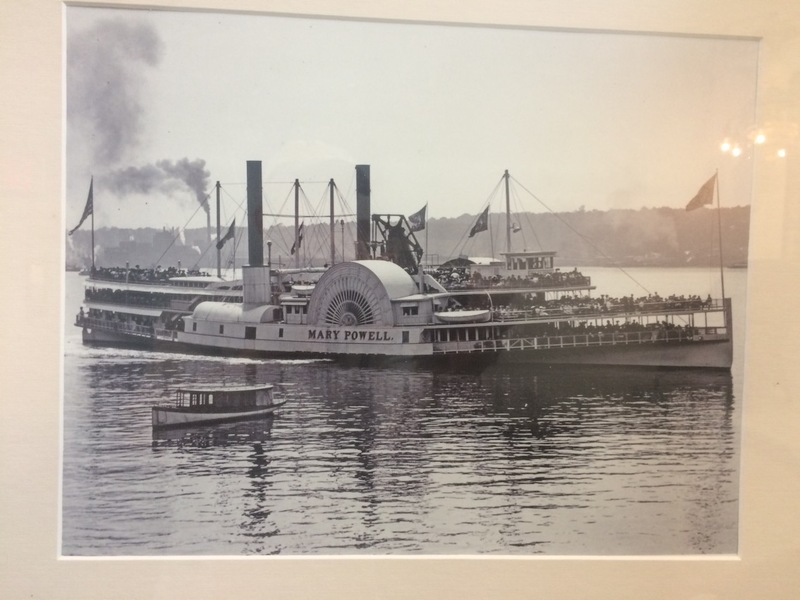 The Clearwater and the Clearwater Festival worked to draw attention to the problem of pollution of the Hudson River. It included mercury contamination and sewage dumping as well as PCB contamination from GE which caused a range of harmful effects to wildlife and people who ate fish from the river or drank the water. Clearwater gained national recognition for its activism starting in the 1970’s, to force a clean-up of the PCB contamination, addressing pesticide run off and much more. Clearwater played a big role in the EPA’s decision to compel the Hudson River’s biggest polluters to remove their toxic wast from the water. In 2002, Peter Seeger was named a “Clean Water Hero” for his prominent efforts in the passage of the Clean Water Act, which has turned out to be one of the most effective environmental laws in United Stages. In 2014, after Pete Seeger’s death, the EPA sited Seeger’s “incredible work” and “his leadership was extraordinary” all of which helped make the Hudson River cleaner. A great man of our time.